Who Is The Real Enemy In The Euthanasia Battle? In Virginia's General Assembly, a seemingly innocuous bill is poised to change the definition of an animal shelter under state law. If enacted, Senate Bill (S.B.) 1381 will require that private shelters operate for the basic purpose of "finding permanent adoptive homes" for animals. With nearly 3 million animals being euthanized every year, according to the ASPCA, this seems like something we can all jump behind, right? If only it were that simple. Every year, the Virginia Department of Agriculture and Consumer Services releases figures on euthanasia and adoption for all shelters within the state, and every year, a single organization is scrutinized under a microscope above all others. Last year, People for the Ethical Treatment of Animals took in 1,025 dogs and 1,606 cats. Almost 77 percent of those dogs and 95 percent of the cats were euthanized. Most people stop right there and return to their lives, harboring a grudge against an organization that already makes them feel uncomfortable with its naked girls garnished like slabs of meat on the sidewalk challenging their long-held beliefs on what constitutes a good meal. Up until last month, I worked at PETA for five years leading high-profile campaigns against some of the most egregious abuses of animals. I helped defeat over a dozen proposed "ag-gag" bills which would have shut down our right to document abuses of animals on factory farms. Undercover investigations conducted by PETA and others have resulted in landmark cruelty charges and convictions around the country, like in Iowa, where PETA helped secure the state's first convictions for the abuse or neglect of factory-farmed pigs after workers were caught beating and sexually abusing the animals. But with "ag-gag" bills, Big Agriculture has threatened to snuff out this crucial work. What does that have to do with S.B. 1381? I'll get to that. In the meantime, I want to state that I am writing this not simply to defend my former workplace, but to reveal what I saw and what I know, and to ask - what are we really fighting for? Well-intentioned groups around the Commonwealth have lauded S.B. 1381 as a necessary measure to stop PETA from killing so many animals. These folks are crusading in the name of an idyllic "no-kill" world, a world in which every animal is saved from that dreaded needle of eternal slumber. It's a world that we all want, PETA needle-wielders and no-kill advocates alike. No one, not even PETA workers, likes delivering that fatal dose. But what separates the two camps is that while the other groups demand that world right here and now, PETA feels that it is unattainable until the millions upon millions of animal births are brought under control. That's why the organization operates at a loss to spay and neuter thousands of animals in its home turf of Hampton Roads every year. But until equilibrium is achieved on a national scale, it's a numbers game-there aren't enough willing, quality homes for the sheer volume of animals entering shelters each year. So, while PETA euthanizes, many other organizations with differing opinions hole up animals in every nook and cranny of no-kill shelters around the U.S. they can find, and some stay there for years upon years with no home in sight. PETA is not a typical shelter, as I discovered one chilly evening in 2009 on my first night volunteering for its emergency pager, a free service for anyone in the community who can't afford to scoop up his animal and drive her to the emergency vet in the middle of the night. I arrived at a dark apartment complex in Newport News unprepared to encounter a terrified, grief-stricken family huddled around a puddle of a puppy in their living room. The puppy was listless and trembling and smelled of blood and feces. She had parvovirus and was already exhibiting the worst symptoms: vomiting and defecating blood all over the furniture, carpet, and walls. Parvovirus, if untreated, is fatal, but treatment costs thousands of dollars and even then is often unsuccessful. Her guardians, with unpaid bills littering the couch and cardboard boxes fashioned into a coffee table, clearly could not afford any semblance of medical attention. Fronting the bill would have prevented PETA from helping hundreds of other animals. There was no solution but merciful death. As I packed the puppy up into the car with soothing words, the family pleaded with me, attempting to withdraw their consent, asking to keep her in their arms until she died. I asked them if they'd want to die that way, puking and bleeding out from the inside. They decided to let her go but didn't fail to mention that she was their fourth parvo puppy that year and, while wiping away tears, asked me to ensure that the next available puppy at PETA was sent their way. With wide eyes, I said nothing more. I met my buddy, a trained euthanasia specialist, at the PETA building in Norfolk, and there we softly pet this little puppy, barely six months of age, who could have had so much life left in her had she simply been vaccinated against this dreadful disease. We cooed at her, soothed her, until she took her final peaceful breath. I cried through the night, and my dreams were haunted. That little puppy received one of the thousand or so dog euthanasia services PETA provided that year. I continued to volunteer on the pager for a couple of years, often seeing feral cats with gruesome injuries - a broken bone, a severed ear, a septic paw swollen to four times its normal size. There is no one responsible for those cats, who would have languished on the streets without PETA. In December, my wife, Rachel, was out on a straw delivery mission, another free service that PETA provides through the frigid winter months. 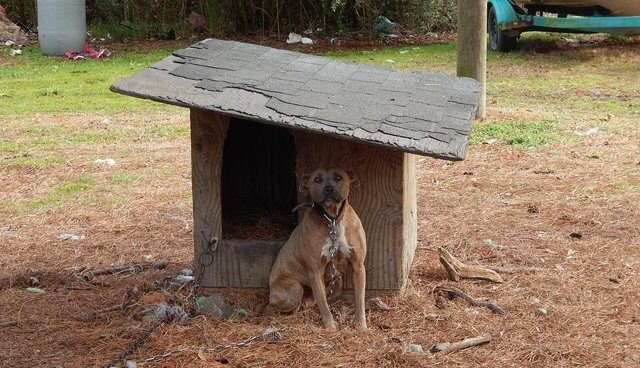 In Virginia and North Carolina, thousands of dogs live life in makeshift pens with an empty barrel for shelter or on the end of heavy chains surrounded by a barren dirt circle. While bringing warm straw bedding to a lucky few, Rachel came across a dog penned in the backyard alongside a few others. She and her buddy inquired about the dog, who was barking madly, ferociously, in their direction. "We never got to naming her," said the property owner with a shrug. Due to years of neglect, the dog's aggression could not be quelled, and Rachel was unable to approach the pen to offer any relief from the biting cold. Put simply, PETA is a shelter of last resort, and S.B. 1381 could hamper the organization's ability to continue this work. So I challenge each group that's thrown its support behind this bill to step forward and take every single parvo dog, every case of uncontrollable aggression, every broken-footed feral under its wings and nurture them into healthy, adoptable, gregarious family companions. Not just one or two miracle cases to parade around on social media, but every single one of them, all while finding homes for the millions of perfectly adoptable animals, too. I can't attest for every single case. We're all familiar by now with that little Chihuahua in Accomack County (If you're not, Google the story, and then come back here). In an article discussing PETA's euthanasia practices, I can't simply pretend it didn't happen and shove it under the rug. But I'll admit that I have no further details about this story, so what I offer here is only speculation. What I do know is that mistakes are made by everyone across the board, whether it be a wrongful euthanasia or accidentally leaving one's senior dog to roast in the car on a hot day. These mistakes are, of course, inexcusable and indefensible, but I do know that at PETA, employees are always, without fail, held accountable for their actions. The vast majority of PETA's other euthanasia cases have been animals surrendered by their owners, who are unable to provide for their basic needs, whether it be medical attention, shelter, or curbing aggressive behavior. So, in the aftermath of mistakes, we have no choice but to move forward, for all these other animals out there. This brings me full-circle back to my original question: what are we really fighting for? The reason PETA's euthanasia figures have come under fire is that they have been hand-picked from the mountain of data by a group with a special stake in the fruits of PETA's labor: the Center for Consumer Freedom. The fancy name belies its true purpose as a front group for the tobacco, alcohol, restaurant, and meat industries. With funding from companies like Tyson Foods and Outback Steakhouse, the CCF denies that the obesity epidemic even exists and has promulgated campaigns against scientists, health advocates, environmentalists, Mothers Against Drunk Driving, and of course, anyone concerned about the welfare of animals. Why? Because if we all succeed, these industries' profits will sink. The CCF's "PETA Kills Animals" website has perhaps been the single most successful tactic in generating widespread discontent for PETA, a group that, despite its reputation, operates solely to help animals, from taking injured cats off the streets to punishing workers who strike pigs with crowbars and promoting alternatives to spraying chemicals into rabbits' eyes in labs. I have befriended the fieldworkers who do the "dirty work" of euthanasia for PETA, and I have seen them toil, cry, struggle, and give all of themselves to bettering animals' lives, and yes, sometimes that involves giving an injection that no one else will give. Whether, after reading this piece, you stand on the side of "no kill" or of PETA's work, the fact is that we all really stand on the same side: the animals'. While animal protection groups bicker back and forth about bills like S.B. 1381 and pour thousands of dollars into campaigning against one another's tactics, who's really coming out ahead? I think you know the answer. The CCF, right now, is sitting back with a bucket of popcorn and watching animal lovers go down in flames. We're just doing their grunt work. The real enemy is not each other, but them, the animal abusers and the industries behind them who want our work shut down for good. From the CCF to the agricultural giants spawning "ag-gag" bills that thwart life-saving undercover investigations, we have our mission cut out for us without fighting each other. Our movement, still in its infancy compared with the multi-billion dollar corporations we're up against, requires solidarity, and we owe it to the animals to give them that wholeheartedly.